valve A device that controls or restricts the flow of a liquid or gas. Also see poppet valve. Also, the mechanical device used to admit, retain, and exhaust air in a tire. The tire valve typically consists of the base, the stem, an inner core, and a protective cap which also serves to retain air in the tire. 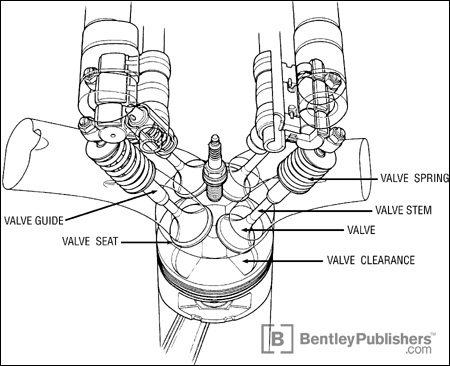 Also see exhaust valve and intake valve. valve clearance The gap between the end of the valve stem and rocker arm or valve lifter; necessary to compensate for expansion due to heat. Also called valve lash. valve guide The cylindrical hole in the cylinder head or block, usually containing a bushing to serve as a bearing surface, that keeps the valve moving up and down in a straight line. valve seat The ring of hardened metal at the end of the valve guide nearest the combustion chamber, against which the back of an intake or exhaust valve rests (seats) when it is closed. valve spring A small spring, generally of coil wire, that closes the valve after it has been opened by the cam, and prevents the valve from bouncing on its seat. The spring's action keeps the lifter in contact with the cam. If the spring is weak, the valve will be noisy and the valve, spring, lifter, and cam will be subjected to hammer-like blows that cause metal fatigue. valve stem Long cylindrical portion of a valve that moves up and down in the valve guide.